Pet of the Week is a weekly feature that highlights a pet available for adoption from the the Humane Rescue Alliance (formerly the Washington Humane Society-Washington Animal Rescue League). 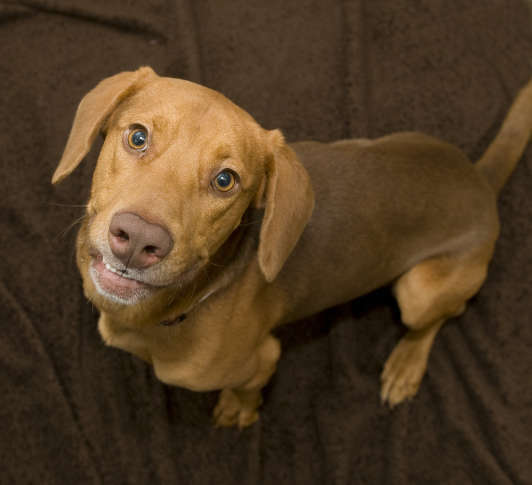 Meet Paul, a very handsome hound mix looking for his forever home! This two year-old has a beautiful red coat that is second only to his beautiful personality. Paul is a sweet but shy guy who loves to be close to people and get lots of attention. Staff and volunteers at Humane Rescue Alliance make Paul’s den a regular stop to pet his soft coat and rub his amazing ears. But Paul does get nervous sometimes and is not crazy about other dogs. His perfect forever home will be on the quiet side and with an owner who is willing to take long walks to show off his playful side and sniffing skills. Paul would do best in a home without small kids, as he is tentative and nervous. But for his new forever family, he will make a fantastic companion. He would rather snuggle and hang out with his people than play with any toy. Gentle, sweet, and smart, Paul will be a great best friend, and he’s waiting for you at the Oglethorpe Street adoption center.